Home » Concrete » Precast & Prestressed » Building Systems » Water / Sewage Treatment Facilities » Building a Water / Sewage Treatment Facility? The challenge for a designer is to build a potable water or wastewater treatment plant, encompassing a pumping room, filtering flocculator / clarifier tank area, aerating tanks and chlorine / chemical areas - plus laboratory and administration offices in a clean environment. Make the plant durable, low maintenance and secure. The answer is to contact Strescon Limited. Precast Prestressed concrete has been the answer for many treatment facilities within the Atlantic region. 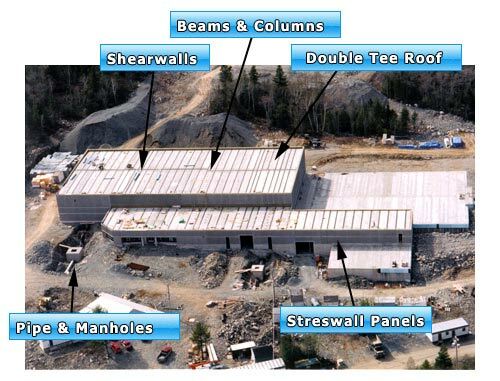 Numerous Precast products have been used in the construction of treatment facilities from load bearing vertical insulated wall panels to Precast Prestressed beams and columns plus Prestressed double tees and or Strescore plank roofs. Precast is chosen as the building material of choice because it can provide a distinctive modern structure with the best possible finish to suit the clean environment required for treatment facilities. Precast concrete is considered ideal for being highly secure in remote areas where most treatment facilities are built. Strescon's water and sewage traetment plants incorporate proven, reliable treatment processes and the latest technology available. plants are complete package systems, custom designed for any application - municipal, commercial and residential. They provide a long life of dependable service and quality.